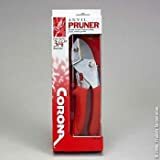 Great pruners! I have used these for over a month now, they are still sharp and cut with ease. I've trimmed all the weeds, tree's and cut along the walkway in our yard.... they cut great, I can't say enough good things about these pruners. One thing I like is they never seem to dull. My neighbor's borrowed them for a few days, they bought a pair so I was lucky to get mine back. 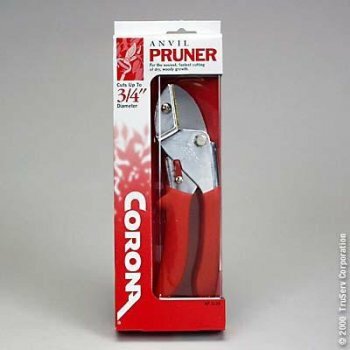 A great value, very good pruners. I have used these clippers enough by now to say they are the best I have ever used. The angle of the blades is so much more useful than the straight ones. The quality is outstanding. 18 months later and I still think these are the best clippers. Yes, it helps to have long, strong fingers. No shame in using two hands, especially when you can cut larger branches than the 1 inch promised. 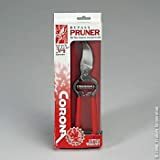 My introduction to the Corona Clipper Company came utterly by chance when I bought their Homeowners 1/2" pruner simply because it was the first one I saw. 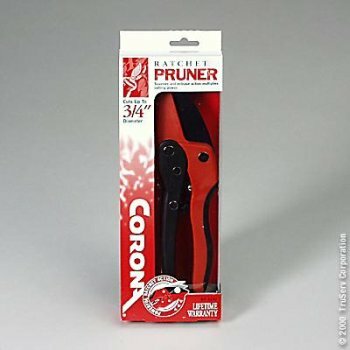 I was so thoroughly impressed with the quality of that pruner that I've since added about a half dozen different Corona tools to my collection, and I want even more! As good as their Homeowner models are, the Professional series has a host of valuable improvements. Ergonomically, the angled cutting head makes for a slightly more comfortable cutting position, and the handles are thicker, so it's a little more comfortable to hold. And joy - the Professional series has a different type of locking clasp that's not nearly as fickle as on the Homeowner's series (my only real complaint about that line of pruners is the rather unreliable clasp). What continually impresses me about Corona's tools is how well they're designed and manufactured. Compare this pruner to pruners that look similar, from companies like Fiskars, and the difference in the quality of the materials and construction is incredibly obvious. The thickness of the blade is a good way to compare brands - Corona's beefy blade is twice as thick as some other brands, so you know it's going to be more durable, less likely to break or wear prematurely. 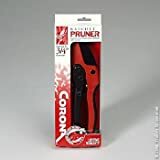 This pruner has a heft and solidity and smoothness of movement that other, less expensive brands lack, and it's this overall level of quality and substantial feeling that makes it a tool that will outlast its competition. When you really bear down on it to slice through a limb, the tool doesn't flex, give, or yield in any measure; it remains solid and just does what it's supposed to, every time. Yes, they cost a little more, but you really do get what you pay for. 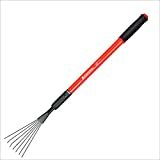 I use mine for clearing leaves and other debris from in bushs and around plants. It is great for those purposes. The idea of using it for a yard rake is totally rediculous. Someone claims to have raked 1/2 acre with this? I wonder how long that took? 2 days? This rake is very tiny. My daughter likes to play in the sand with it, and it is just the right size for that. It is not a full sized rake. The quality is okay, though. From the moment I pulled this out of the box, I knew it would quickly become one of my favorite garden tools. The painted finish is excellent, high quality, and the telescoping mechanism works great with a positive "click" to set it at any convenient length. Great bang for the buck...if you're looking for a versatile hand tool it would be hard to beat this one! Corona Clipper GT3050 , cheap, reliable, sturdy. 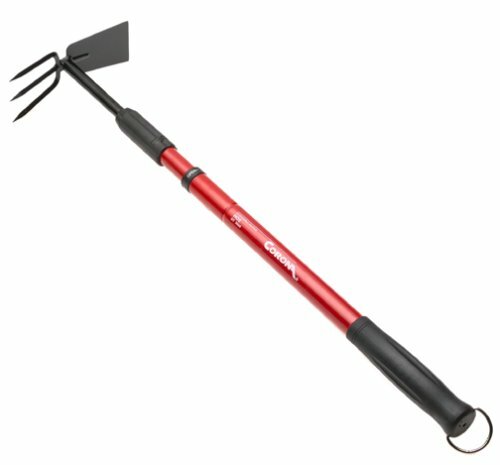 My garden was a formidable obstacle... that is, until I purchased the Corona Clipper GT3060 Extendable Handle Hoe. The most attractive feature of this is hoe is that it can collapse to 2 feet in length ' perfect for Lawn Gnomes and other vertically challenged people. Wrap your hands around the metal shift, and with a gentle twist, the hoe grows to over 3 feet long! While the extendable shaft is what originally drew me to this hoe, the "infinite handle length" claim was perhaps a bit boastful. Screw strips out with normal use. The metal strips out that a screw that holds the balde turns into. The blade and tool can then not be used and the tool becomes useless. This occured with below normal home use. Cuts tree limbs great ....but.. I thought about purchasing this item through ... but found it for less than the ... price listed at the time of this review. 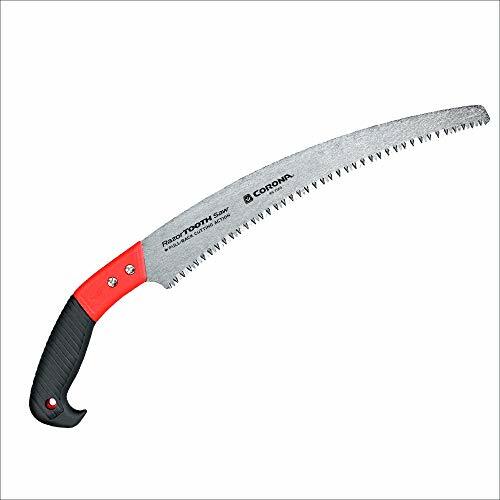 None the less, this product does a pretty good job at cutting and extending to lengths that reach most of the limbs of a reasonably sized tree found in yards of most residences. There were two things that stood out as far as dealing with this item. The minor of these is that the saw blade that is attached to the working end of this pole seems a bit too flexible. Would have been nice if it was made of sturdier metal. It was good however once you get a start in the cutting of the tree limb! Nice and sharp! The second, more troublesome aspect, was that the screw-down, that keeps the pole from extending (more than your desired length) would sometimes allow the pole to slip through during the cutting of a limb. Hopefully, with use, this will eventually no longer occur. Other than that, the foam grip area on the lower portion of the pole makes for a really great grip when in use. And as far as the pruning blade goes; it was very easy to trim small branches! While purchasing this item I saw others that had plastic/nylon parts. This one has metal (where the saw and prunining mechanism are attached). MY WIFE HAS TROUBLE WITH HER HANDS. ITS NOT STRONG ENOUGH TO CUT BRANCHES WHEN WE DO OUR GARDENING. I GOT THE RACHET CUT AT A FOOD & PRODUCTS SHOW AND ITS FABULOUS. SHE CAN NOW CUT ANY SIZE BRANCH WITH THIS PRODUCT. SHE STILL HAVE TROUBLE USING OTHER KINDS OF CUTTERS. I'm really glad I tried out this pruner. It is the best I've had so far and I have 60+ roses to prune. I haven't had it long enough to rate it's durability but I do know it cuts smooth and clean. And it cuts through some hefty canes. Be sure to remember it has rachet action and let go and reapply pressure for your cut. 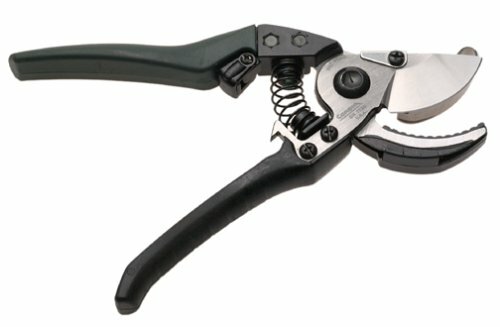 Excellent pruner for the price. Ratchet Pruners are the Best-but not this one! Being female, I use ratchet pruners in yard work because they allow me to cut thicket stems without muscle strength. 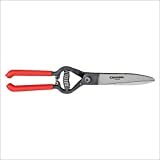 The price of these pruners was right, so I ordered a pair. Imagine my surprise when I realized my hand wasn't large enough to allow the mouth of the pruners to open more than an inch. 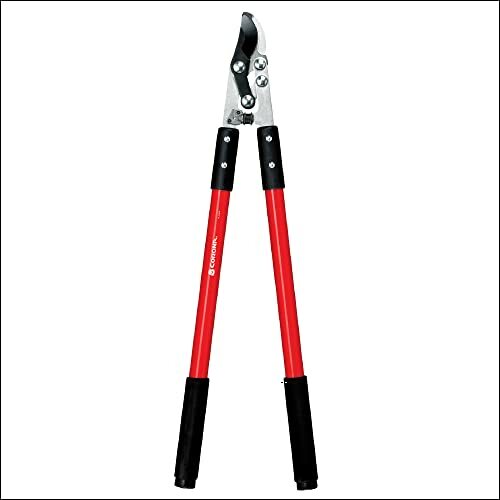 These pruners will only open to their full size for a person with very large hands. My hands are a size seven. Even my husband, who has size 9 hands, complained that he had to let the grip on one side go before placing the pruner on a branch. Once on the branch it takes two hands to make them operate! Very Disappointing! Stick to "Florian" pruners...more expensive ...but no problems! 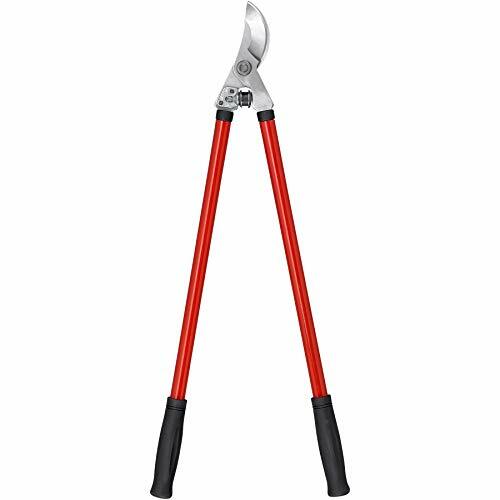 As a former Horticultural Therapist working with elderely and disabled people I have bought these pruners for many clients. The important thing to know is that you must use these pruners as instructed to prevent them breaking. Firstly, cut straight across the branch so as not to twist the blade. Then squeeze to cut BUT Let GO as soon as you feel resistance - and then squeeze again. This technique will give you about 30% more cutting power and they will last for years. The safety catch can be a bit fiddly but usually loosens up after a while. As far as I'm concerned this saw is great. It's sharp, it cuts well, I think the curve of the blade actually helps with cutting 2-4 inch hardwood trees. Maybe as a previous reviewer mentioned it is too thick but it works well for me. I can cut through a 3 inch cherry branch (I've done this numerous times now) while basically hanging in the tree and I'm done in less than 30 seconds. No I'm not exaggerating. Try doing that with your typical handsaw. I purchased this saw and a Fiskars 93626935 PowerTooth Folding Saw at the same time. While this is a larger saw, I still end up using the Fiskars more often. They are more portable (and safer because the blade folds away) and do as good of a job on anything less than 2-3." For anything larger than 3" a bow saw (poperly tensioned) can beat the nonsense out of a clipper in handcutting. But I will saw that a bowsaw is akward up IN a tree, and that therefore there is a nice place for clippers in tight pruning spots. Still given a choice, the Fiskars beat this any day. I have a few of these and I really put them to the test. I also have other, larger pruning saws, but these small saws are very handy. When properly cared for (oiled to prevent rust, sap/pitch removed) they last for a long time. I can cut through a 6" Oak branch with one of these in minutes. Keep it sharp, develop the arm/shoulder strength and coordination, and you will be surprised-perhaps amazed-at what you can do with this implement. My experiences and perspectives seem to be rather different than the previous poster. I disagree in regards to the blade shape, thickness, and coarseness. The curved blade is, in my opinion, a good design. I also have saws from Fanno (another maker of quality pruning eqpt.) and they are all curved. In fact, all my common pruning saws, from 13-24" have curved blades. I have a large timber saw (think 3'long 1man version of the traditional 6' two man "misery whip") and a folding saw with straight blades, but these are the minority. The short, straight saw is very useful when pruning the unwanted branch or trunk from a "Y" or double trunk, but that is about all I use it for. The timber saw is used much like a bucksaw and the straight blade is fine for that purpose. The curved blade serves two purposes. 1 It helps you maintain a straight line around the branch. I am sometimes in an awkward position, straining, and/or exerting strenuously when pruning. The curved blade wraps, to some extent, around the blade and helps maintain a straight cutting line. A straight cut isn't terribly important when making the initial cuts on a large branch (1st cut removes weight from branch), but is very important for the final cut. The final pruning cut should be straight and consistent-just outside the branch collar. 2. It grabs the branch on the pull stroke and helps cut more effectively. With a straight blade, the saw would, to an extent, ride on the branch. With the curvature, the blade digs in. My long pole saw also has a curved blade. I rely on the curved blade particularly with a pole saw-it greatly increases the effectiveness. The curved tip also helps me grab onto a branch to dislodge it if it falls into a crotch or other difficult location. I can't envision doing all my pruning with straight blades. I don't find the blade to be too thick. A pruning saw is subjected to much rougher treatment than a woodworking saw. While a thinner blade would cut faster, it would also be prone to damage. I keep my saws very sharp and they cut well. I don't recall ever thinking; "Hmmm, if this blade were thinner I would be through this branch already..." More like; "I enjoy using this saw, it is an extension of my body and has never failed me..."
The number of teeth per inch are also suitable. Yes, a crosscut saw for woodworking would have fewer teeth per inch. Woodworking pieces need finer edges for appearance, joinery, etc. That isn't a concern with pruning. As long as one doesn't tear out a large piece of bark, all is well. I also think that the wet, pulpy nature of living wood would clog a finer pattern. It feels very good to cut branches with hand tools-chainsaws are noisy, foul-smelling beasts. I also use this saw for rough cutting of 2x4 and 2x6 lumber. I love this loppers and it took me awhile but I found the replacement blades. Call Corona toll-free, phone number listed at their website coronaclipper.com. These items are not listed on their website-Part #FL3420-1 (blade) and #FL3420-2 for (anvil). Hope this helps!! Great tool for general pruning. Do not believe reviews downgrading this product due to alleged false claims regarding blade replacement. Those blades are available. I just purchased one. It is about $.... Buy it and have fun pruning. I love to use this anvil lopper. It makes trimming SOOO easy. But now I'm disappointed because there is no replacement blade to be found. The product still advertises replaceable blades- I just saw them in the store! That's not right! Good lopper but replacement blade is not available! I really liked this lopper. I've had it for over 2 Years and worked it really hard. Unfortunately, I loaned it to my neighbor and he gave it back to me with a couple of large chips in the blade which makes it difficult to make a clean cut through a limb of any size. Sure wish I cold get as replacement blade! If replacement blades were available, I'd rate this lopper as 10 Stars!! We was in a crisis over in Skunk Holler (which is a suburb of Moonshine Holler). Ned the Barber was fed up with wearin' out all his shears and scissors on his clientele (and we're a hairy bunch) to the point he was thinkin' about shuttin' down. Can't be no civilization without a barber, so I lended Ned my CORONA CLIPPERS. And these just ain't any ol' clippers. With 24-inch handles and a cutting diameter up to two inches Ned has the leverage and power he needs to slice through shaggy manes that ain't been combed in years. Heck, flat-top, buzzcut, crewcut, or mullet, Ned can create any look you want with just a couple of snips. And with nonslip foam grips he don't make the unsightly mistakes he once did with his rusty scissors. Cousin Buford is so taken by Ned's skill with this lopper that he even goes in to get his back and armpits trimmed (of course, Buford's got thyroid problems that seem to kick up during a full moon). This product has a long name, but it saved our little town. CORONA CLIPPER FL-3460 COMPOUND-ACTION BYPASS LOPPER. You know, Uncle Cy had to have a bypass, but I never figured it had to do with clippers. And all of us here in Skunk Holler thought Coronas were green bottles of beer. Sure proved us wrong, by golly! This is a solid tool. 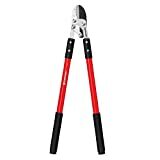 With hollow fiberglass handles it weighs almost nothing.I do not however recommend this tool for the small yard homeowner.These are very big and awkward loppers. 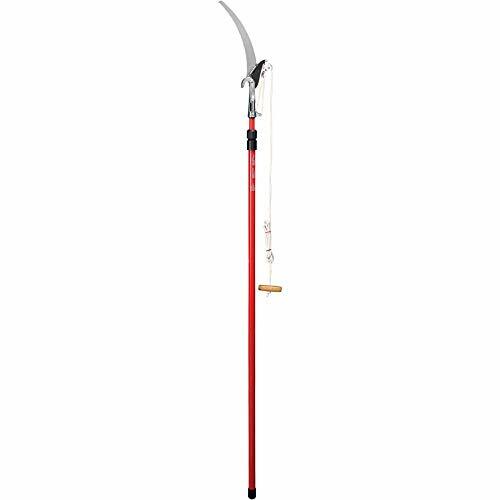 With 24'' handles you really get the reach out of them but,in most cases this size lopper is just too large.It is a fine quality tool that will last a lifetime if maintained properly.If you intend to just putt around the yard or garden doing seasonal pruning. This tool might not be your best bet.Amazon offers a big selection of corona tools so, find the tool that fits your needs best. Now get out there and do some major pruning. This tool behaves exactly as advertised and then some. The handles are super comfortable, even after using the tool all day. The compound action really does make it easy to cut through even the largest branches and vines. The rubber stop prevents jarring. Best pruner I've ever owned! Heavy duty chain drive, compound action pulley system triples your cutting power. 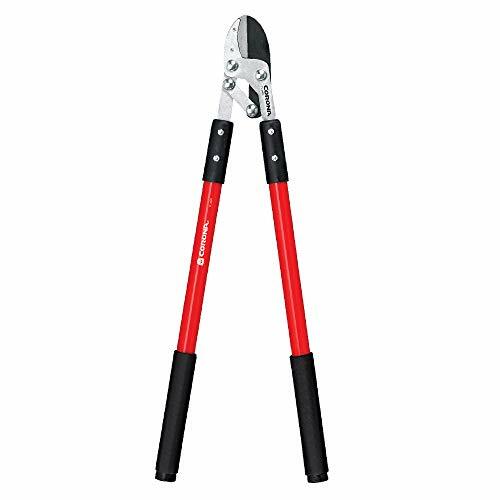 If you have a lot of small plant and floral pruning to do, the Cut 'N' Hold pruner may be the tool for you. This tool has a comfortable ergonomic handle, and its blade is set at a 45-degree angle off the handle for more efficient use of your strength and less hand fatigue. The heat-treated radial-arc blade can be resharpened, is easy to replace, and has a wide cutting surface. 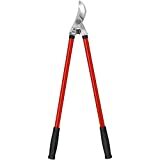 I had a set of these for years, until I loaned them to a neighbor, who loaned them to a friend, who had a cousin who needed to trim a few trees, and well, its spring time again and I need another pair. Wood handles are a blessing and a curse. You should't leave them out in the rain, like some children I know, On the other hand they are easy to repair/replace. two bolts and the clippers are as good as new. They flex just right to take some of the jolt out of the cutting. I suppose that you could argue that cutting wood with wood ain't natural, but it works. There is a reason that wood handle tools are still around. This is a bypass lopper. It is for light pruning. Not for CUTTING BRANCHES. A solid anvil prunner WILL CUT small branches. If you use a bypass pruner like this for cutting anything but new growth, you will damage the tool. This is a large (but still somewhat delicate) instrument. Not a brute force tool like a saw or anvil pruner. As a bypass pruner, it is by and large my favorite for use in trees. The blade has remained sharp after 2-3 years and the tool is in excellent condition despite high humidity in my barn. 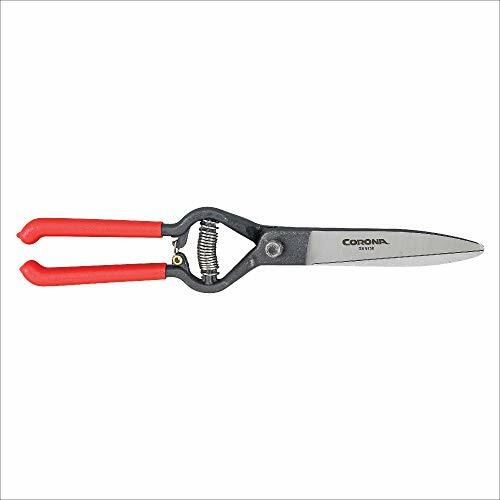 If you need to buy just one pruner, this is not the tool for you because it is not for heavy weight (anything past new gowth cutting). But if you have a heavy duty anvil pruner and would like a light-weight pruner for finger vegatative (not woody) and new wood growth, this is it!!! This product is a not as advertised, all the packaging says "Made in USA" but the clipper says "Taiwan" in small letters on the blade. I suspect that the other reviewer, the one who gave 5 stars, works for Corona. There is no way these things can cut 11/2". I used them to cut branches of 1" or less on shrubs and decorative evergreens. Cutting was laborious. I thought the handles were going to break! They did not cut cleanly either. At the end of the cut a small piece of the branch slips between the two cutting blades and the whle thing jams up. I am returning this tool. 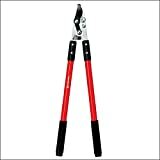 You might be satisfied with this product if you want to cut very small branches, etc because they are light-wieght. The last lopper you'll buy.